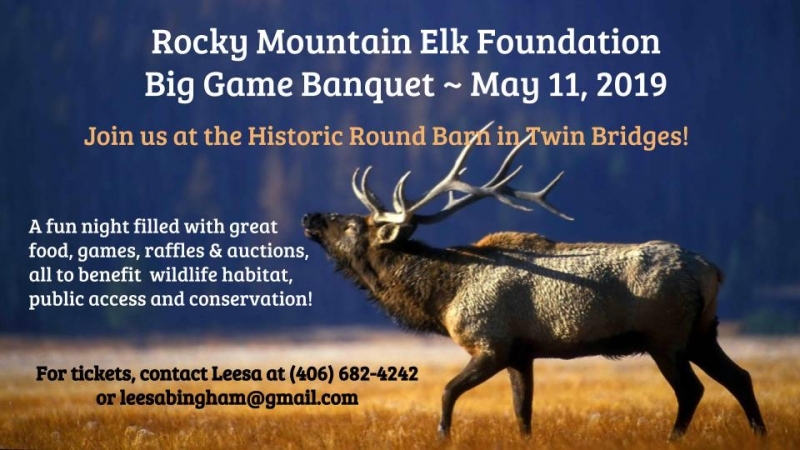 The Vigilante Chapter of RMEF Big Game Banquet is coming May 11 tot the Round Barn in Twin Bridges. Catered by Pic A Nic Basket and supported by numerous volunteers and business donations from Madison County, it’s set to be another fun evening of food, friends, raffles, and auctions. A variety of quality firearms, outdoor gear, artwork and home decor, gift baskets and certificates will be on the auction table. With more than a dozen different games and raffles and a variety of ticket packages, there’s opportunities for everyone. And guns galore, more than we can list, will be up for auction, raffles and games. Tickets are available now by contacting Leesa Bingham at (406) 682-7272 or via email at leesabingham@gmail.com. Historically the Big Game Banquet sells out, so you’re encouraged to get your tickets early. There’s many ticket packages available, including sponsor tables for groups. Funds raised go to improving wildlife habitat and public access.